We know that the dog is man's best friend and that a dog is most often the saviour of humans in war ravaged areas. One could not help but be amazed at the courage of military and police dogs that run during gunfire and save people, walk on explosives and find them, or spot enemies. Thousands of military and police dogs are working all over the world in war-affected areas, including Sri Lanka. A heartbreaking story emerged recently from a war zone, about an unusual true love between a soldier and his military dog. The British Military working Dog Regiment plays a key role in counter insurgency and improvised explosive device (IED) detection; searching and helping to clear routes, buildings and vehicles in Afghanistan and helping to guard and patrol key installations to assist and enhance security. 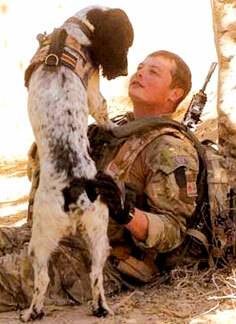 United in death: Lance Corporal Liam Tasker with his dog Theo. They died within hours of each other. Both their bodies are to be paraded together through the streets as a hero’s farewell. It also provides a range of other capabilities wherever its skilled force is needed in the rest of the world. This regiment comprises 284 soldiers and officers and about 200 dogs. While the number of American Military dogs working in Afghanistan is about 50. Army dog handler Liam Tasker, a Lance Corporal in the British army, was said to be inseparable from his 22-month-old spaniel, Theo. Liam Tasker was shot dead while on patrol north of Nahr-e-Saraj in Helmand province in southern Afghanistan. Theo, who was trained to search for bombs, survived but, seeing his handler dying, on returning to the British base at Camp Bastion, died of a brokenheart.The two best friends were united in death through tragedy. The dog and the soldier were stars in the Army, as they had uncovered 14 home-made bombs and hoards of weapons in just five months - a record for a dog and his handler in the conflict. Theo has always been the 'front man' in Army missions, sniffing out any hidden IEDs, weapons and bomb-making equipment. The British military also has released a statement saying that Theo's and L/Cpl Tasker's work have helped save thousands of lives. Recently they took part in a mission in the Nahr-e-Saraj district in Helmand, but a shooting broke out with the Taliban and L/Cpl Tasker was shot dead. After his body was flown back to Camp Bastion, his beloved Theo, who was healthy and strong is thought to have died of a broken heart (from a heart attack.). L/Cpl Tasker joined the Army in 2001 as a vehicle mechanic in the Royal Electrical and Mechanical Engineers but after learning about the dog unit and seeing a video of them in action, the animal lover transferred to the Royal Army Veterinary Corps in 2007. He has spent 15 weeks on a handlers' course with Theo, where they learned to work as a team and developed their bond. Theo was very successful at detecting explosives and his tour of duty at the war zone was due to be finished in a month. Unfortunately, neither he nor his handler ever could leave Afghanistan alive.Animals like Theo save thousands of lives around the world. One could not help but pay tribute to such noble animal heroes that save the lives of cruel and flawed humans.